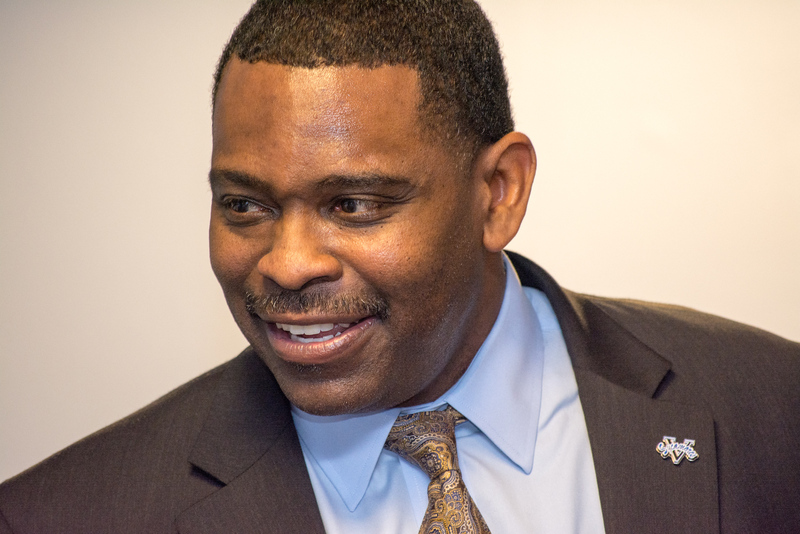 Indiana State University President Daniel J. Bradley announced today (Feb. 28) that Sherard Clinkscales has been hired as the new director of athletics. He was formally introduced at a news conference this afternoon inside Hulman Center. "I am excited to bring Sherard back to Indiana. His experience and strengths will bring great balance to ISU athletics, and I am looking forward to working with him to advance our athletics program," said Daniel J. Bradley, president. Clinkscales' initial focus will be on marketing, ticket sales and fundraising, Bradley added. Clinkscales comes to Indiana State from North Carolina State where he most recently served as the senior associate athletics director for student services and sport administration. "First, I want to thank God for this opportunity," Clinkscales said. "I'm extremely grateful to Dr. Dan Bradley and the administration at Indiana State University. I can't wait to meet with the members of the Sycamore family as we get the ball rolling with Sycamore Athletics. I feel very honored and blessed to be the director of athletics at Indiana State." Clinkscales joined N.C. State in July 2011 as an associate director of athletics and was quickly promoted in January 2012. While with the Wolfpack, he worked for legendary athletics administrator Debbie Yow. "Sherard is a professional whose first concern is the quality of the experience for student athletes, followed closely by a desire to engage alumni and fans in the life of the University and athletics department," Yow said. "He is thrilled to return to his home state and ready to make a difference for Indiana State. We will miss his sizable contributions, but we always knew he was destined to become an AD. "Clinkscales was selected following a national search, chaired by Diann McKee, Indiana State senior vice president for finance and administration/university treasurer. "We were encouraged and pleased that our pool attracted a large number of experienced and highly competent candidates," McKee said. "The search committee felt we had merited serious consideration from highly qualified athletic professionals. The position profile was not an easy match -- having a strong background in NCAA compliance, fundraising, and Athletic administration set a high bar." Clinkscales provided oversight to multiple administrative units and sports at N.C. State, including strength and conditioning, sports medicine, nutrition, housing and student services. He also served as the departmental liaison to the Academic Support Program for Student Athletes (ASPSA) and supervised baseball, wrestling, volleyball, as well as the men and women's soccer programs. He was also a member of the Athletics Cabinet and participated in financial and capital deliberations. Clinkscales served as Vice Chair for the ACC Wrestling Committee as well. He currently serves as the chair of the NCAA Committee on Sportsmanship and Ethical Conduct. In the summer of 2013, Clinkscales attended the prestigious DIA Athletics Directors' Association Athletic Directors' Institute, a "by invitation only" gathering of the most talented intercollegiate professionals. Clinkscales is a graduate of Purdue University with a bachelor's in history and came to N.C. State after working two years for the NCAA at its main headquarters in Indianapolis. With the NCAA, he served as an assistant director of championships. In addition, he was chosen to serve on a number of internal committees. He drafted and presented sport-specific legislation to the NCAA Championship Cabinets and Management Council, and also led the NCAA's Division III branding initiative throughout all championships. As Assistant Director of Championships, Clinkscales had direct oversight over seven different championships, including men's and women's soccer, women's lacrosse, national collegiate rifle and men's hockey. He directed a staff of 35, and was charged with leading the individual sports committees during tournament selections, building relationships with external constituencies and creating revenue opportunities around championships while managing a budget of roughly $500,000. Clinkscales came to administration after a long and distinguished career as an athlete, coach and scout in college and professional baseball. A first-round draft pick of the Kansas City Royals, he played three seasons in the Royals minor league organization before injuries derailed his playing career. Clinkscales parlayed his connections into a position with the Atlanta Braves as an area scouting supervisor (1997-99). He later was the Tampa Bay Devil Rays assistant director of scouting (1999-2001) and returned to the Braves as an area scouting supervisor (2001-05) before being promoted to the position of Professional Scout. He left the professional ranks in 2006 and served as an assistant baseball coach at Notre Dame from 2006-09, where he was the pitching coach and assisted in recruiting. While at Purdue, Clinkscales did walk on and play for Gene Keady's 1989-90 basketball team, which finished as Big Ten runner-up. His teammate and roommate on the road was Matt Painter, now head coach of the Boilermakers. Clinkscales is the co-founder of After Sport Group, an organization that conducts on-campus career workshops for student-athletes. He is currently pursuing a master's at North Carolina State in the PRTM program with a concentration in sports management. Clinkscales has two children, a son Alex (16), and a daughter Tara (14), who both attend Cary High School. A graduate of Purdue and most recently senior associate athletics director at North Carolina State University, Clinkscales' initial focus will be on marketing, ticket sales and fundraising.